Double-star system T Pyxidis seen on Sept. 19, 2011. NASA's Hubble Space Telescope has given astronomers a rare look at an enormous stellar eruption, allowing them to map out the aftermath of such blasts in unprecedented detail. Hubble photographed an April 2011 explosion in the double-star system T Pyxidis (T Pyx for short), which goes off every 12 to 50 years. 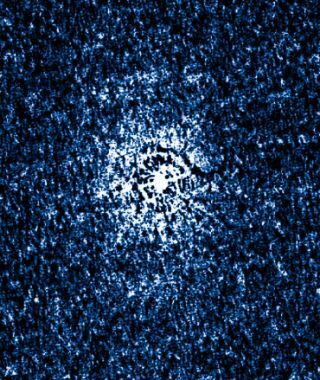 The new images reveal that material ejected by previous T Pyx outbursts did not escape into space, instead sticking around to form a debris disk about 1 light-year wide around the system. "We fully expected this to be a spherical shell," study co-author Arlin Crotts of Columbia University said in a statement. "This observation shows it is a disk, and it is populated with fast-moving ejecta from previous outbursts." These three images taken by NASA's Hubble Space Telescope reveal a disk of previously ejected material around an erupting star being illuminated by a torrent of light unleashed during a stellar outburst. Image released June 4, 2013. The erupting T Pyx star is a white dwarf, the burned-out core of a star much like our own sun. White dwarfs are small but incredibly dense, often packing the mass of the sun into a volume the size of Earth. T Pyx's white dwarf has a companion star, from which it siphons off hydrogen fuel. When enough of this hydrogen builds up on the white dwarf's surface, it detonates like a gigantic hydrogen bomb, increasing the white dwarf's brightness by a factor of 10,000 over a single day or so. This happens again and again. T Pyx is known to have erupted in 1890, 1902, 1920, 1944, and 1966, in addition to the 2011 event. Such recurrent outbursts are known as nova explosions. (Nova is Latin for "new," referring to how suddenly novas appear in the sky.) Novas are distinct from supernovas, even more dramatic blasts that involve the destruction of an entire star. The new study clarifies just what happens to the material ejected by such outbursts. "We've all seen how light from fireworks shells during the grand finale will light up the smoke and soot from shells earlier in the show," co-author Stephen Lawrence of Hofstra University said in a statement. "In an analogous way, we're using light from T Pyx's latest outburst and its propagation at the speed of light to dissect its fireworks displays from decades past." The study represents the first time the area around an erupting star has been mapped in three dimensions, researchers said. The team presented its results today (June 4) at the 222nd meeting of the American Astronomical Society in Indianapolis. The study will also be published in the June 20 issue of the Astrophysical Journal Letters.